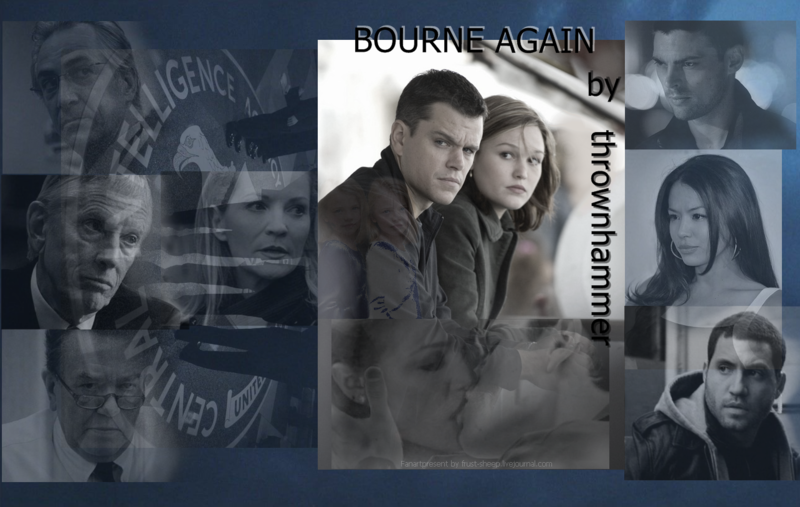 It is a recommendation for the Bourne fandom again for the Nicky & Jason ship. The story is called "Bourne Again" and it was written by thrownhammer. COMPLETED Odd chapters are Nicky's perspective about her introduction to the program. Originally she was trained as an asset, only to later be reassigned after 9/11. EVEN are in the present and follow Bourne as he puts the last few pieces of the puzzle together. In his search for the lynchpin to fold up the whole operation if it went south, he learns to hate truth more than lies. The story has 25 chapters, the rating is Mature and the story is already completed :D , what sadly offer not many Bourne ffs. I think it is a Alternate Universe ff, but don't let that be scare you away, if you don't like AU ff's. Because then maybe I would say, what would be the fun in fanfiction? ;) All what I want is, give it a chance! I can only recommend this Bourne ff. It is absolutly BRILLIANT written in every aspect and I enjoyed and love this story so so much. Please leave the writer some love, READ Bourne Again and REVIEW!!! Because it deserves so much, much more reviews. I still can't believe, why the count of reviews is really not more. WARNING: The first version of the fanart has SPECIFIC SPOILERS (so it is under a spoilertag) !!! => Comment, because = ♥! => Credit is a MUST! => NO HOTLINKING! => NO ALTERING! => NO STEALING! => DON'T POST IT ELSEWHERE, except Livejournal (but you can ask me & maybe I say yes)! I don`t own the pictures (they are © to their respective owners), characters, actors, plot etc., they are not mine. I will post the credit links soon! Thank you!!! I was looking on the fanfic board for something to read (I just joined it a second ago) and found your review! Thank you again! The artwork is BEAUTIFUL! Reina is there too! I've never seen that pic of her, it is wonderful! I have it on my desktop already and I am rushing to update my cover art! You are very welcome. :) I hope you liked it a little bit and I hope you agree with my choice of the specific spoilers. ;) And yeah, the clothes are not really right, but I could not do better. BTW: I uploaded the two versions in my scrapbook now, so it is larger. Photobucket did not like that size. I saw it while searching "Multifandom Het Recs". Is that Lamb and Lynx Gaede? It's okay if it is, just wondering who they are. Do you mind it I see your Photobucket album? I have some caps to send you, is email the fastest way? There are quite a few, lol. Which fanfic site do you like reading on the most?